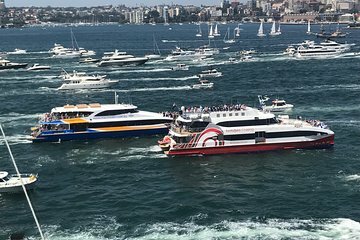 Aproveite os assentos na primeira fila para as festividades do Dia da Austrália neste cruzeiro especial em Sydney Harbour. Assista o Ferrython do Festival de Sydney, o Tug and Yacht Ballet, o Harbour Parade e o Tall Ships em direção à Sydney Harbour Bridge. Veja a Sydney Opera House a partir da água e aproveite os eventos que acontecem durante todo o dia a partir de um local privilegiado no Porto de Sydney. Seu cruzeiro parte de Darling Harbour e inclui um almoço leve com chá ou café. very good cruise. the crew were friendly and professional led by Lisa being a great hostess. more and better food than i expected. the boat was not overbooked so there was plenty of opportunity to go anywhere on it to view whatever was happening on the harbour. they showed good client service and flexibility in asking the passengers whether we would be happy to stay out on the water for an extra 20 odd minutes to watch the end of the tall ship race. even though we are local sydneysiders, we would go again next year or the year after. Best place to be on Australia Day for the harbour events. Captain put the boat in the right place for everything, even stayed out an extra half hour to complete one of the races. Couldn't fault it.